Mushrooms in your yard might signify a problem with your soil underneath the lawn. It sprouts mushrooms when conditions are right, such as when the soil is cool and damp. Treating a lawn with fungicides might not stop the mushrooms from returning because typical fungicides don’t kill mushrooms completely. 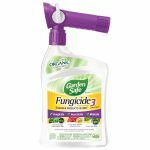 There are quite a few consumer friendly fungicides available for home use, such as Garden Safe’s Fungicide 3, and Bio Advance Fungus Control. For heavy or recurring fungal outbreaks, commercial fungicides, such as azoxystrobin or flutolanil must be applied several times by a professionals only. Heavy thatch build up creates a layer between the grass and soil. 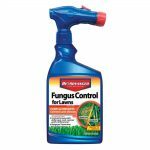 This can the fungus bellow and prevent fungicides from reaching into the soil. Decaying organic matter, such as animal waste or decomposing leaves, that trap moisture. If you have excess moisture from pooling water and or poorly draining soil can also stimulate fungal growth. An easier way to keep mushrooms out of your lawn is to modify the conditions of your lawn. Following a lawn maintenance program will go a long way to keeping your lawn free of disease and fungus. Aerating the soil once or twice a year, and removing thatch helps the water flow. A weekly lawn service with mowing will keep you grass from growing too long and trapping in moisture. Removing the excess moisture that mushrooms need to grow. Amending soil or improving drainage will keep water from over saturating your yard. Using a nitrogen-rich fertilizer helps the grass grow thicker, thus squeezing out bare areas where mushrooms break through. Pick the mushrooms when you see them so they don’t mature enough to spread spores. Cleaning up pet waste and removing decomposing plant material such as fallen leaves removes the mushroom’s food, keeping them from fruiting. There is no perfect solution to remove lawn mushrooms, but taking time to understand the causes will help you be proactive therefore preventing them from sprouting. If they do sprout then you be ready and less likely for them to return.